VRE Security Cages are all made with heavy duty wire mesh sides with a durable angle frame. All are welded in house and then hot dip galvanized for long lasting durability. The cages offer full ventilation, strength and rigidity, and the hinged door(s) are pad-lockable for security. 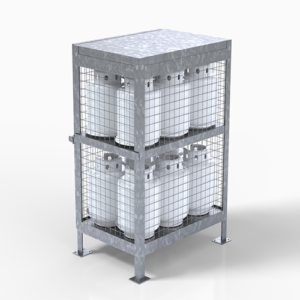 While the cages are primarily designed to safely store propane cylinders (both 20 lb and 40 lb), they can be used to store any item that needs to be secure (i.e. tools).